If for some reason the term “oral surgery” throws you into a world of anxiety, you should know that some of the most common dental treatments involve oral surgery. This specialty area of dentistry can be performed only by doctors receiving specialized training and following specialized education. Beyond that, however, oral surgeons work hand in hand with other dentistry practitioners and are a very important element of a successful dental treatment. Let’s see today how our interventions of oral surgery in Fort Lauderdale Florida help you achieve perfect dental health and are an integrated part of a special dental treatment. Wisdom teeth removal is probably the most commonplace dental procedure requiring oral surgery. The problem with impacted teeth is that they need to be removed to allow you to enjoy good dental health. However, an oral surgeon doesn’t just take care of wisdom teeth, but also other impacted teeth that can jeopardize your smile and dental health. Also, an oral surgeon can help your general dentist deal with a tooth that is so decayed or damaged that can’t be repaired. Implanting a tooth root and fusing it to the jaw bone requires oral surgery. Sometimes, in order for a dental implant to be successful, you need to have your jaw bone strengthened with jaw bone implant – another intervention achieved by an oral surgeon. Oral surgeons work very closely with their colleagues who are specialized in dentures and braces. Sometimes, for braces and dentures to perfectly fit and achieve the best results, you need to have some crowded teeth removed or some jaw bone issues to be fixed. Your oral surgeon will make sure your teeth and jaw bone are ready for braces and dentures. 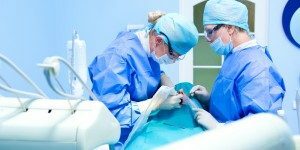 Why Should You Choose our Interventions of Oral Surgery in Fort Lauderdale Florida? We offer all dental services under one roof: we work with inter-disciplinary teams to offer you complete and comprehensive dental treatments so you don’t waste time and money running in between dental offices to get only parts of the treatment performed. We also work with the best specialists in the field, people having decades of experience and training, staff that is involved in continuous education and practice. We work with the latest and best equipment, materials, and techniques, and the most modern certified laboratories. Last but not least, we work creatively by your side to make all your treatments of oral surgery in Fort Lauderdale Florida affordable and comfortable.